Konqueror is complete! Mine is a bit smaller; finishing 20" smaller on the sides and the bottom. #7 Konqueror. 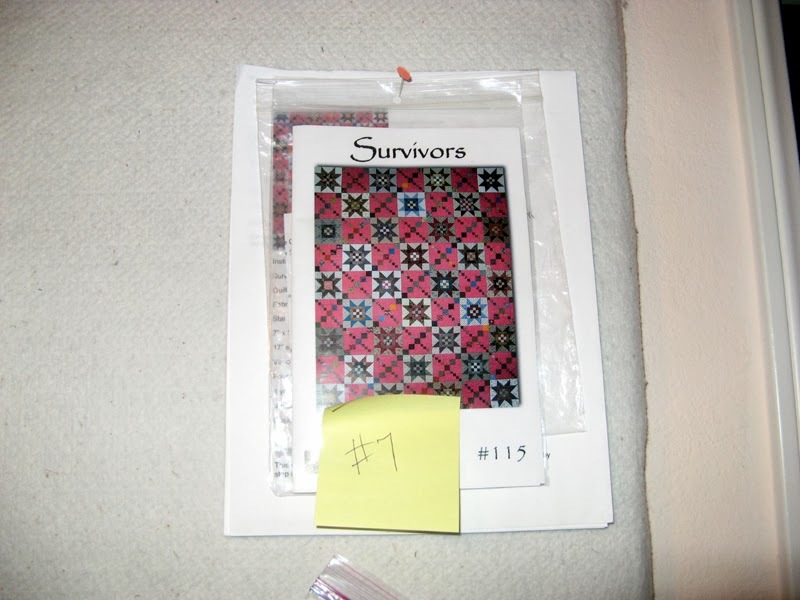 Survivor is a design by Joyce Weeks of Geoff’s Mom Pattern Co. 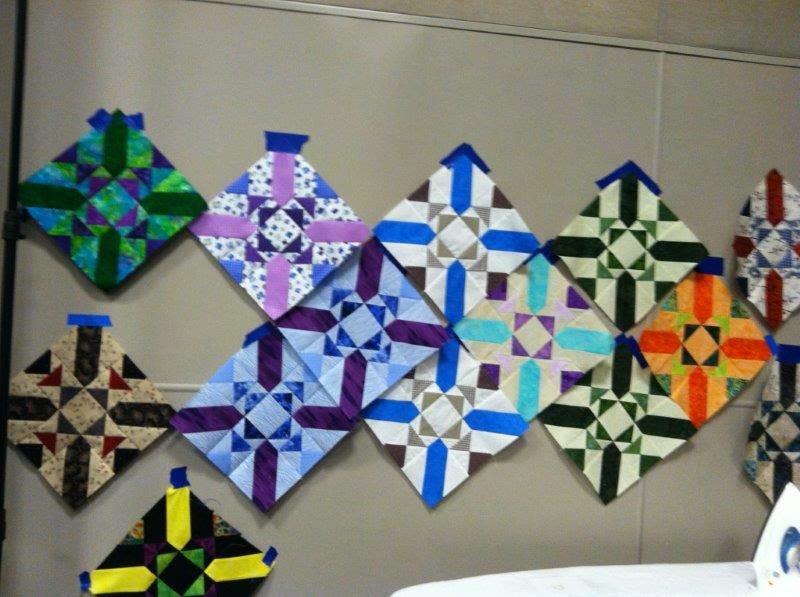 This is the first San Diego Quilt Show workshop I have taken and the second year workshops have been offered. 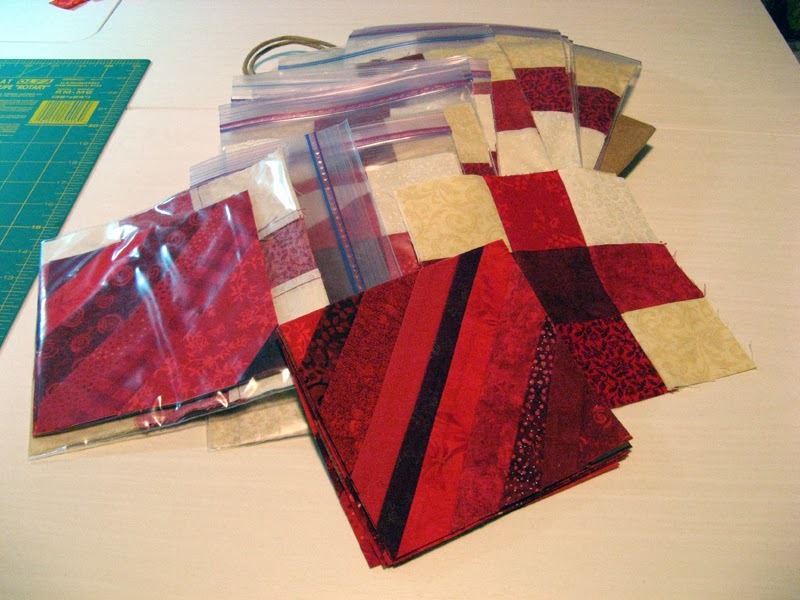 I purchased Mourning Grays and added in some fabrics from my stash as well as additional purchases from several area quilt shops. 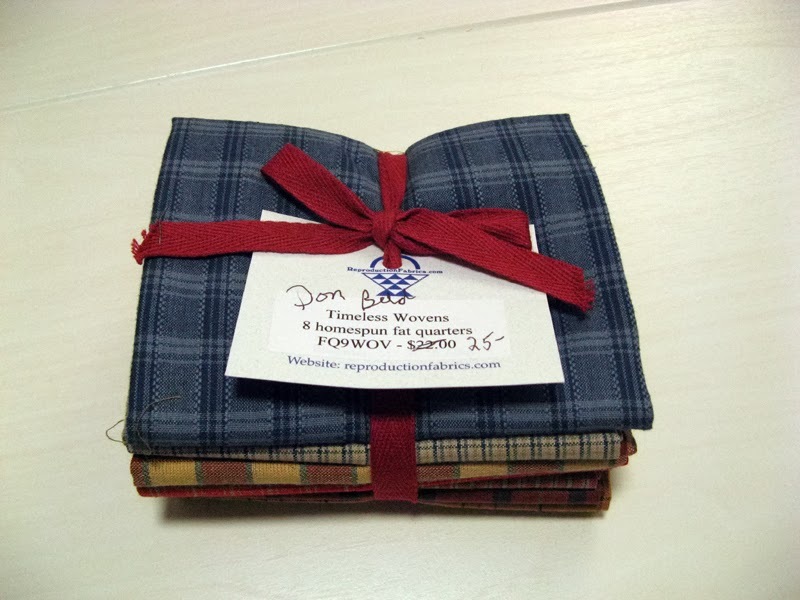 The last couple of years has me interested in reproduction fabrics. The workshop was in September 2013 at the San Diego Convention Center. Keltic Krest is complete! I made the smaller version. 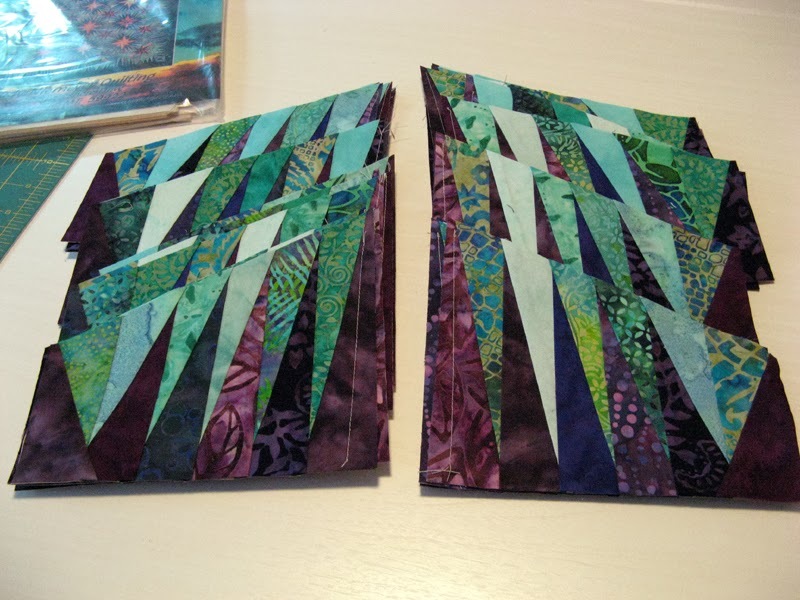 I have been done with the piecing through the triangle border for sometime now, but just now put the green outer border on. I am planning a blue binding. #13 (Extra Credit) UFO; 2013 Mystery Celtic Solstice. Bonnie Hunter has given her readers a mystery annually for several years that starts in November. One that comes in several steps each week usually with the last step released right around New Years. Once Konqueror was complete I put the labels on Kartwheels and Koriander Kompass that Road to California Quilt Show provided. A very nice embroidered label. Then after the outer border went on Keltic Krest the binding and sleeve was put on Kilowatts. 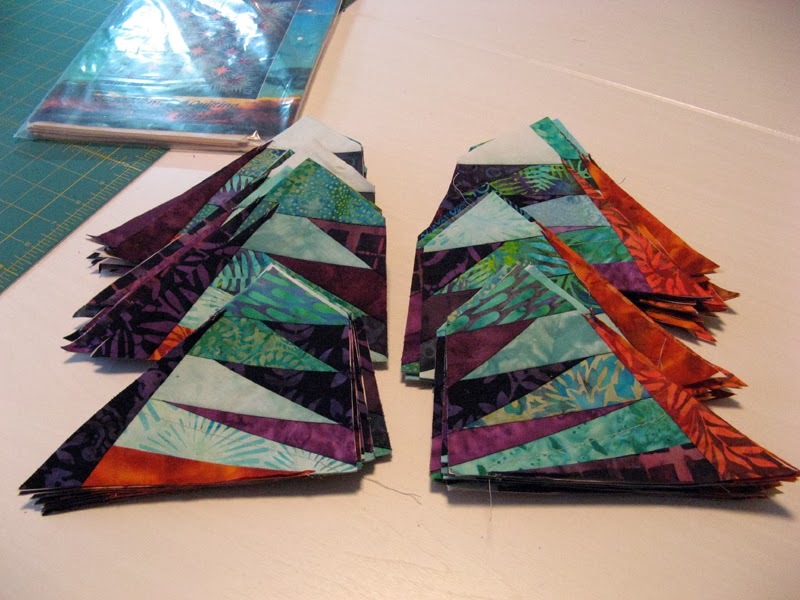 Now comes the time for 400" of hand sewing. Today I will be putting together backs and cutting batting for Krossfire, Konqueror, and Keltic Krest. 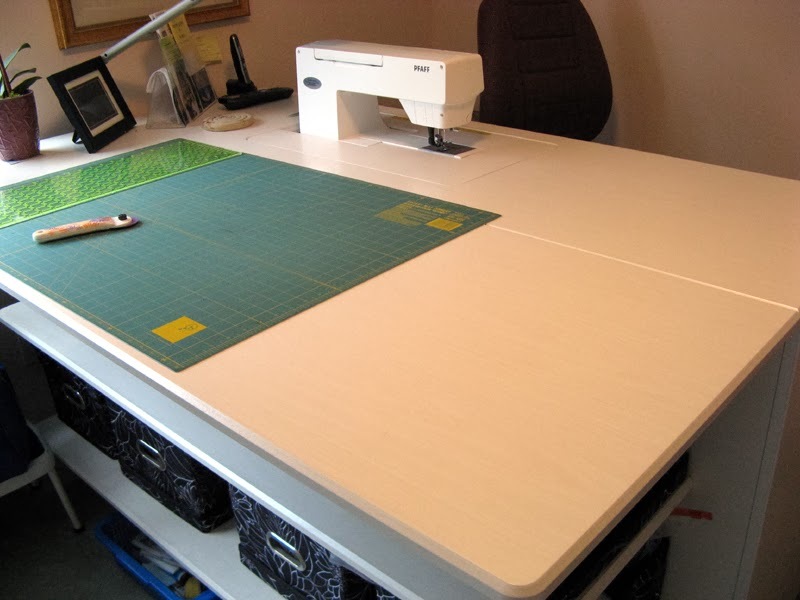 Hmmm...wonder what project I will work on next...the sewing table is clear. I am thinking Kaptain Khorous is the one to finish. It is a UFO this year so I can be one up and fulfill the gift for Logan that I have been planning since his birth last year. These came today from Cathy. Love the chickens on the top red string block. Just one more to receive before I sort them all out. My bathtub is filling up! I'm itching to start on my Talking Turkey project... It happens to be one of my 2014 UFOs. Swap blocks arrived at my door. Teresa W brought her blocks on Monday. 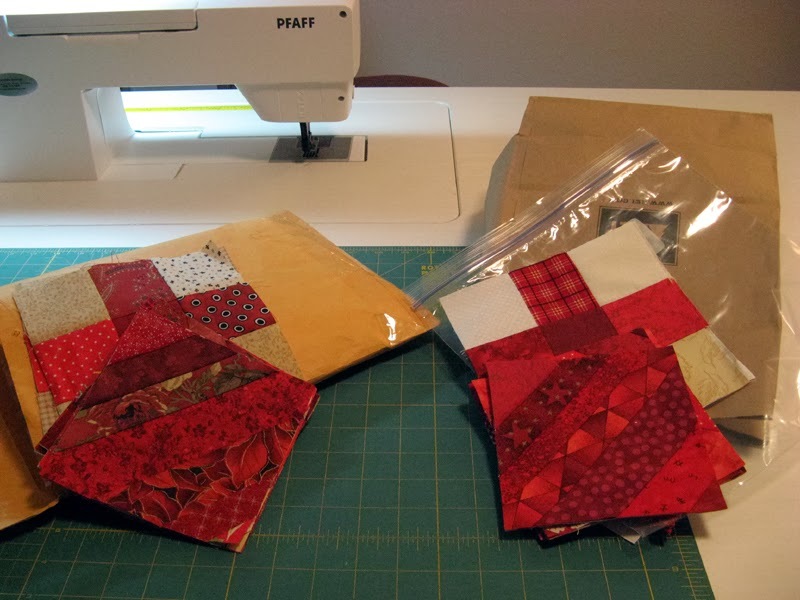 Joan T, Liz, and Collette blocks arrived on Tuesday. There are still a couple to arrive before I can start the sorting out and send back to everyone who participated. I am very excited by all the variety in the reds, as will everyone else. I have decided to make my Survivor a bit smaller than what the pattern suggested. 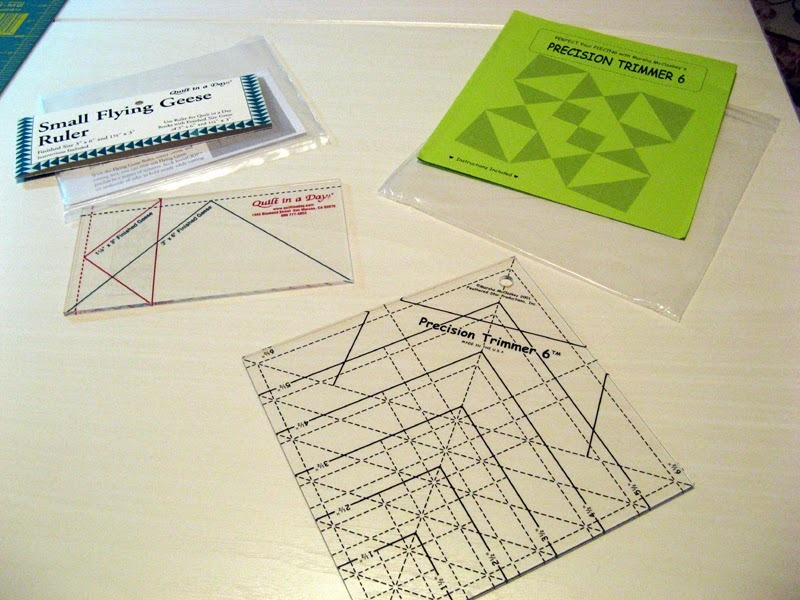 I want the look of the design, to experience a new teacher in Joyce Weeks, and along the way use a different kind of ruler. My project gave me all of these. Mine will finish at 50" x 70" instead. I might be hard to see the different colors used; they are gray, purple, black, and rosy gray for the background. With a good sewing night tonight and tomorrow finishing Konqueror by the end of the month looks possible! I have Konqueror on my design wall today. This is my January UFO that I'm working very hard to finish by the end of the week. I spent most of January finishing Krossfire so now I'm paying the price :)! All good though; having Krossfire finished makes me very happy. 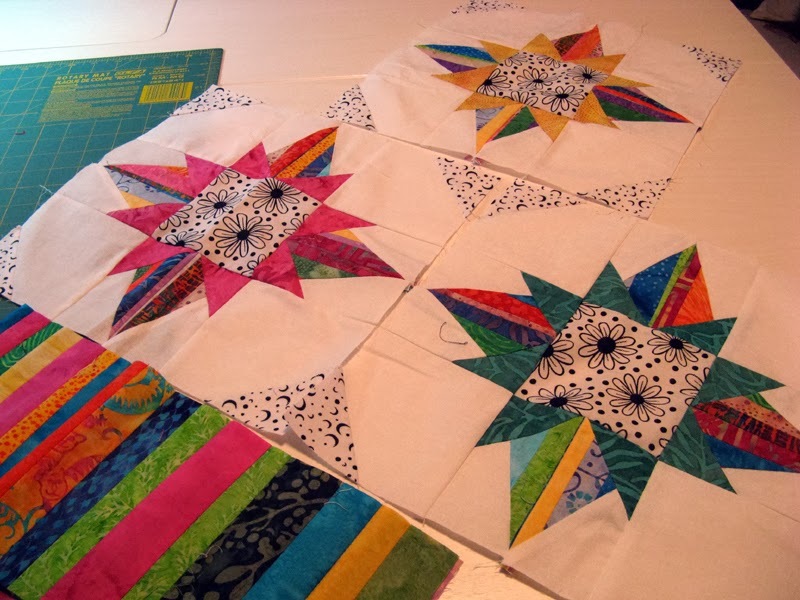 These are the next blocks to be assembled, the Star Block. Off to the right are more of the 4-Patch units that are also ready to assemble. 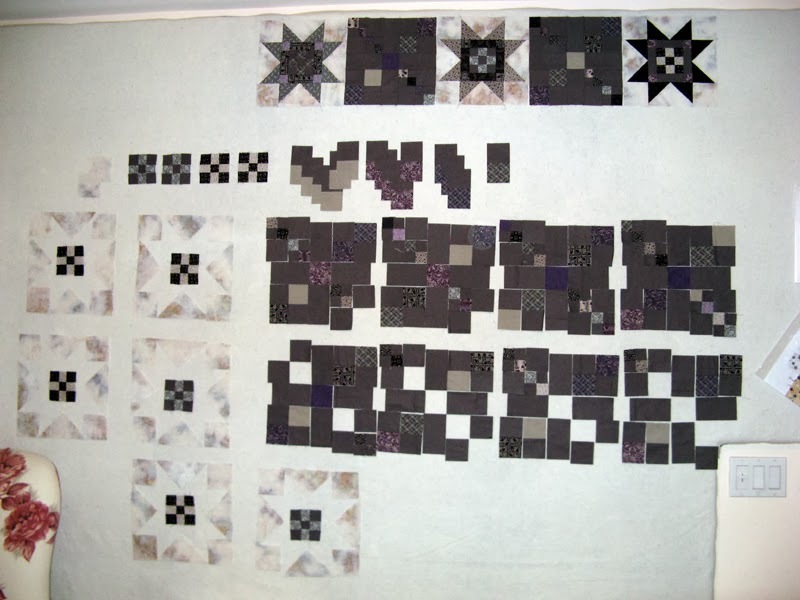 I am thinking I don't need a 70 x 90 quilt as the pattern calls for...perhaps I'll make it one row less both down the length and across the width. Road to California 2014 was a great show as always. 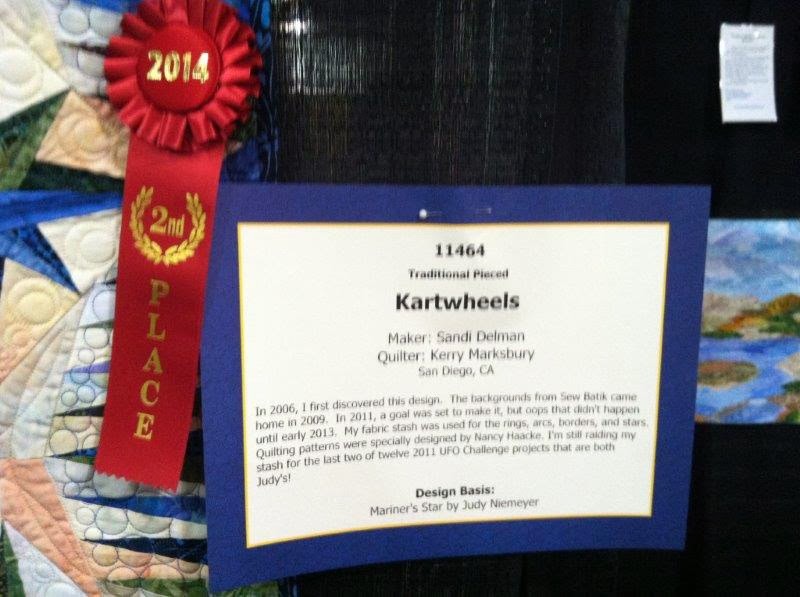 It was made a bit more special since Kartwheels took 2nd place in the Traditional Pieced, Wall category! I also was lucky to have Koriander Kompass entered. Hopefully next year they accept Krossfire; at least that's where I'm aiming for it to be. 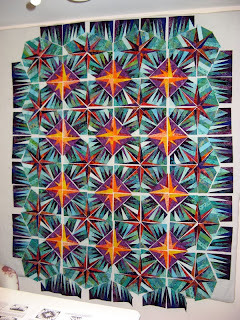 This is the result of a day of instruction with Janna Thomas' Star Fusion design. 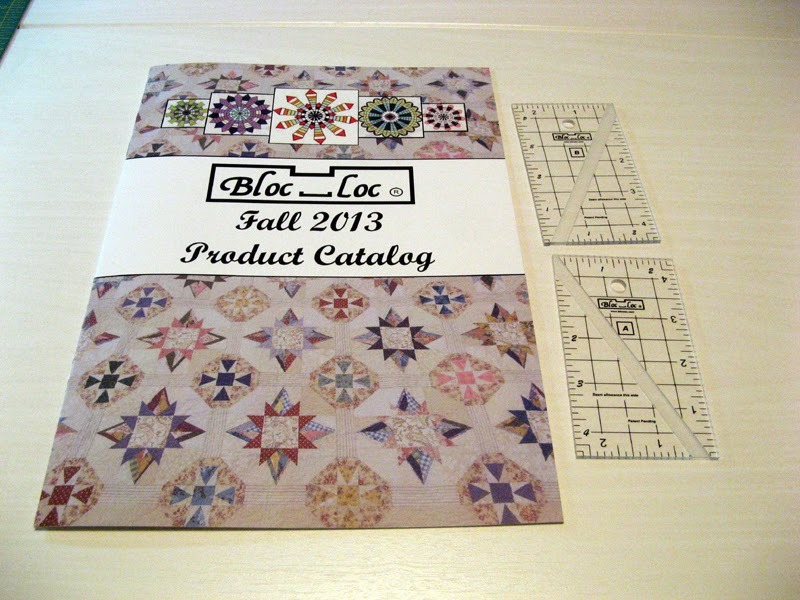 Janna's Bloc Loc rulers are used to create the affect of the major star points made from strip sets. 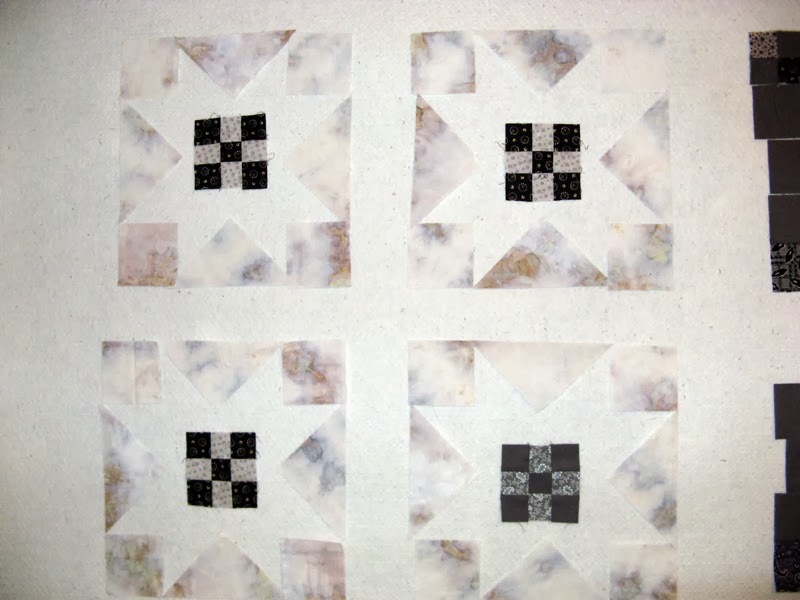 It is a fun design that I will make in both the black and whites that you see in my class project and the Glorious Color fabrics that arrived a little too late for the class. 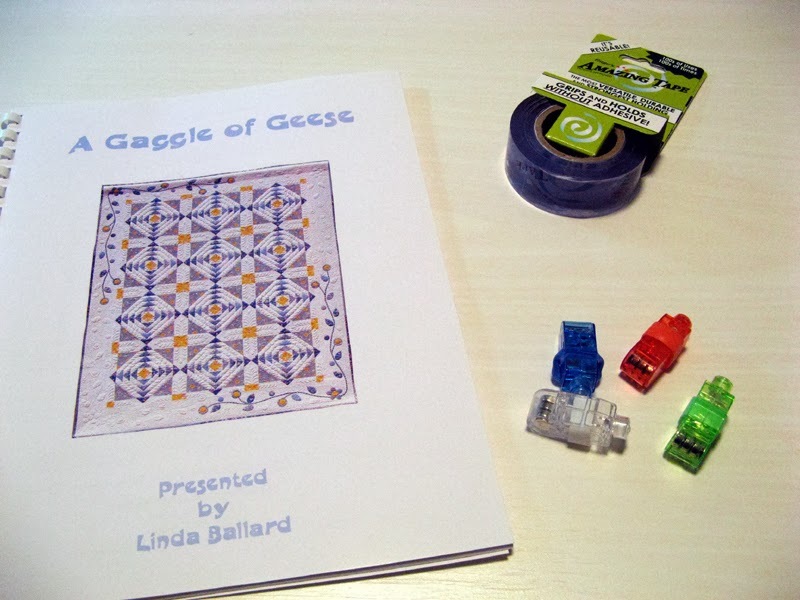 I helped Linda Ballard out as her VIQ (aka class helper). 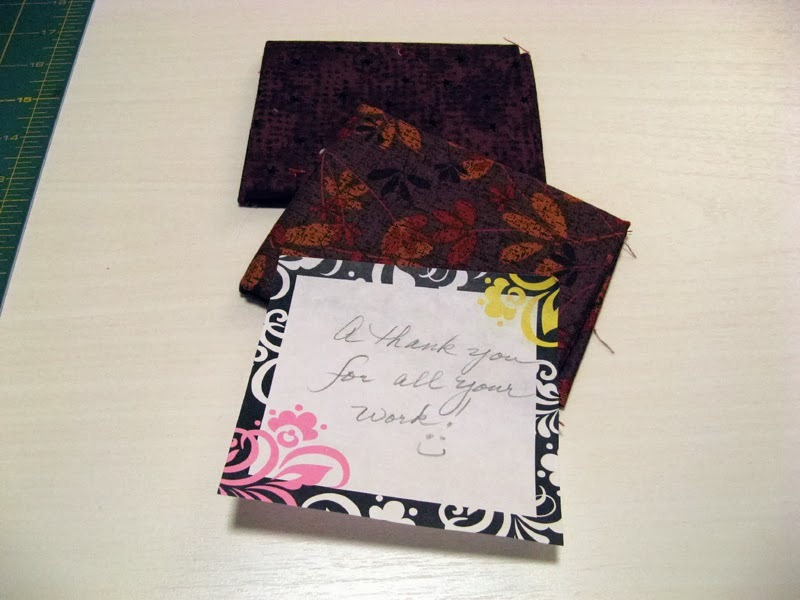 As a thank you I was gifted a pattern. I really like the applique on A Gaggle of Geese. I'm not much of an applique quilter, but I do dabble a bit from time to time. The tape and the finger lights are purchases I'm anxious to try. This is my version of Harmony Square. There is a snowball block that gets into the design as well. Let me close with my Blue Ribbon for Kartwheels. If you haven't tried for a show it is well worth the experience. Let's start off with receipt of Red Strings/9-Patch Swap blocks turned in. Mary and Debbie have done a nice job with their reds. 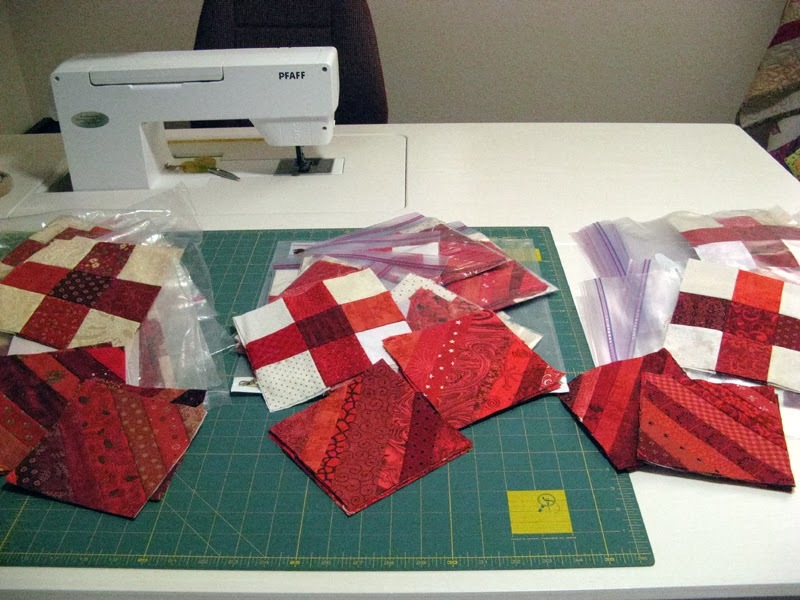 Mary says she has already started on the rest of the reds she'll be using for her Talking Turkey project. 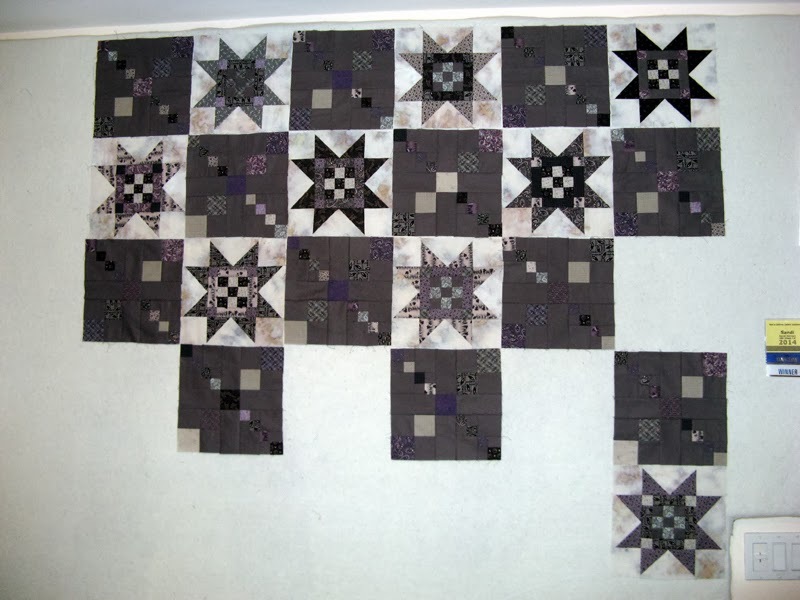 I'm not as far along as Mary, but plan to make my blocks into the same Bonnie Hunter project. Here is the damage to my stash stats this week. First from Beverly's at the start of the week I purchased a green for the borders of Celtic Solstice that I'm calling Keltic Krest. 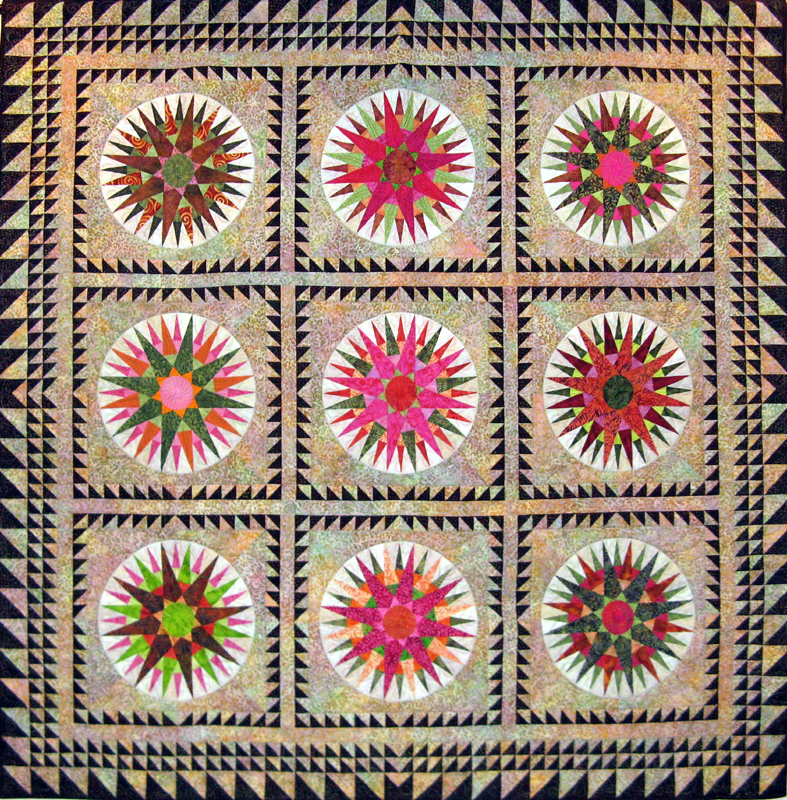 The other two fabrics were used in a class that I took at Road to California Quilt Show by Linda Ballard called Harmony Square. My project will be called Kaptain Khorous and will be for Logan. Don't you just love the pirates? 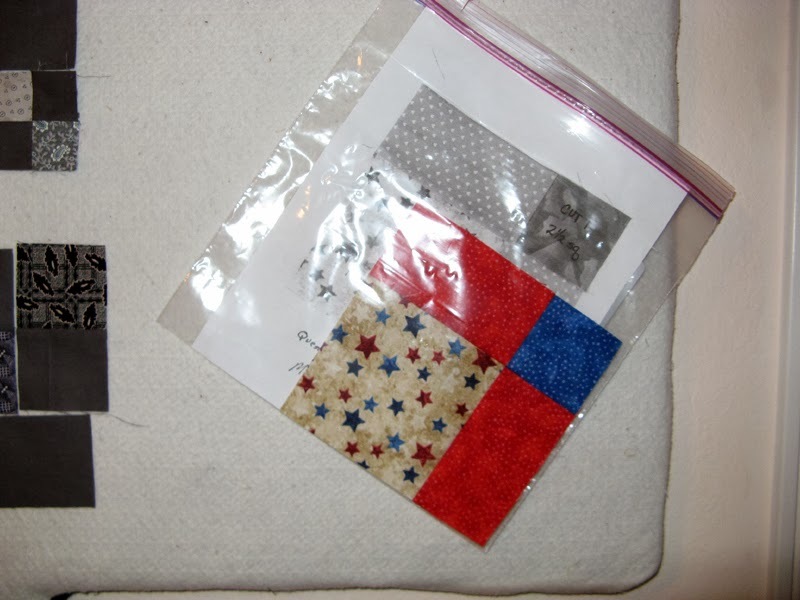 Next up are the fabrics that were intended and will still be used for Star Fusion by Janna Thomas the other class I took at Road to California. My project will be called Krackerjack. 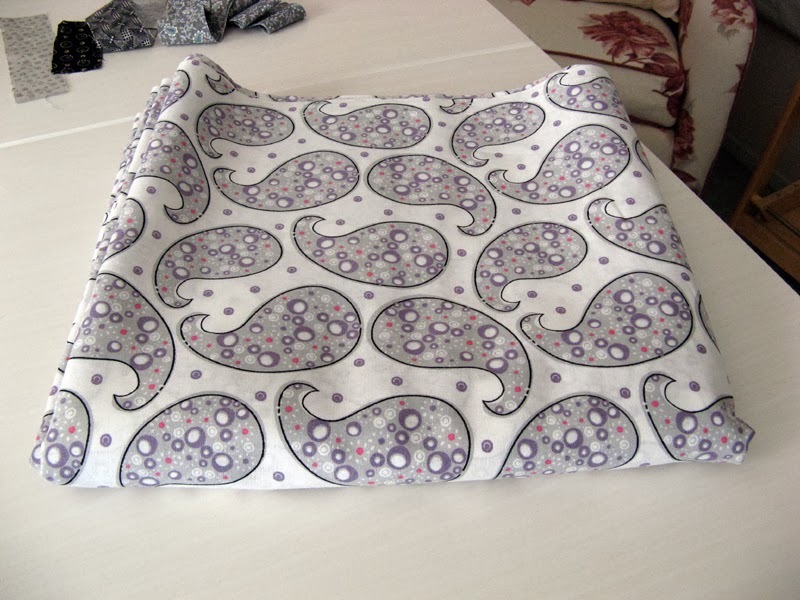 The fabrics didn't arrive until after we left for the class, but I do intend to use them for the same design. I may change the direction of the star points in the pattern. There are several ways Janna shows and probably dozens more. I ended up using white and black medium scale prints with good results during the Tuesday class. Last purchase is for the back of Konqueror. Konqueror is from the pattern called Survivor by Joyce Weeks. 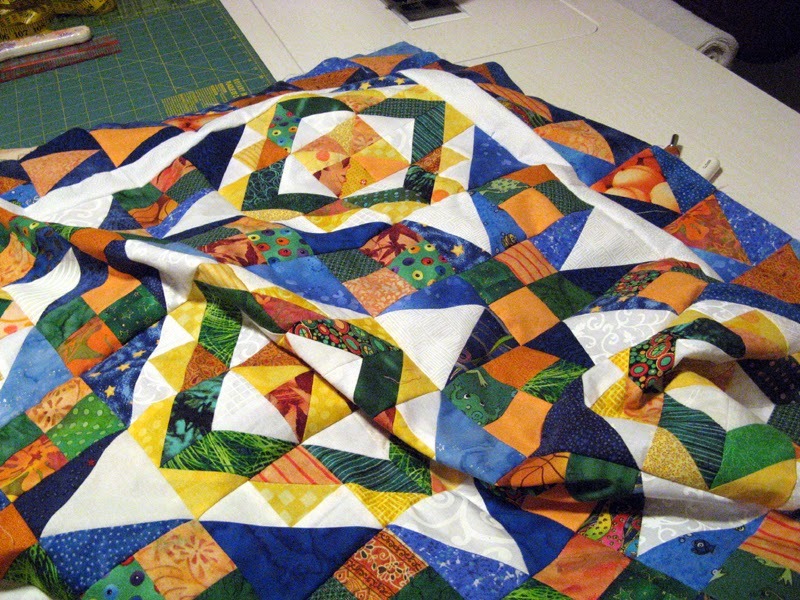 I'm working real hard to get this project done by the end of January...it is my first UFO of the year with 52 Quilts. Can't start off the year with a delinquency. All said and done with purchases for awhile. Now is time to sew and finish!! 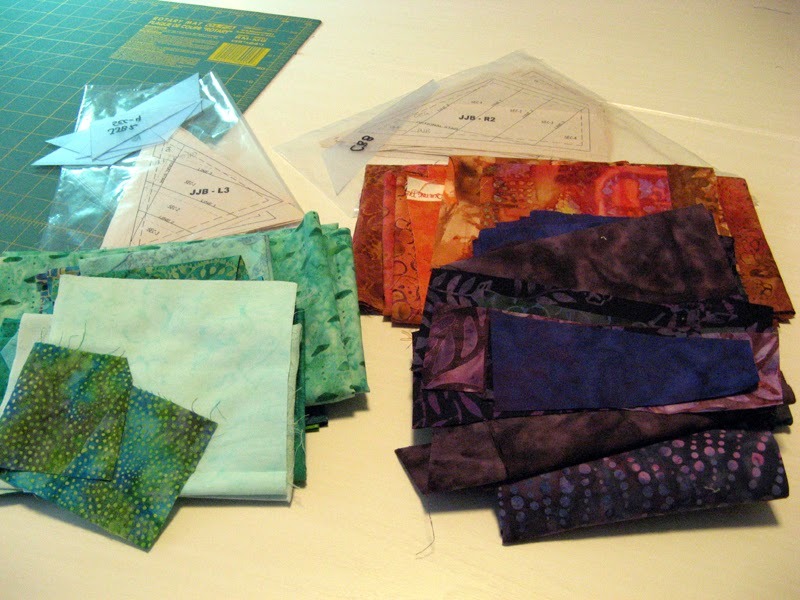 Hope you are having a great start using your fabrics in 2014. Others are working on using their stash too. Check them out at Patchwork Times. There are two blocks in this pattern. 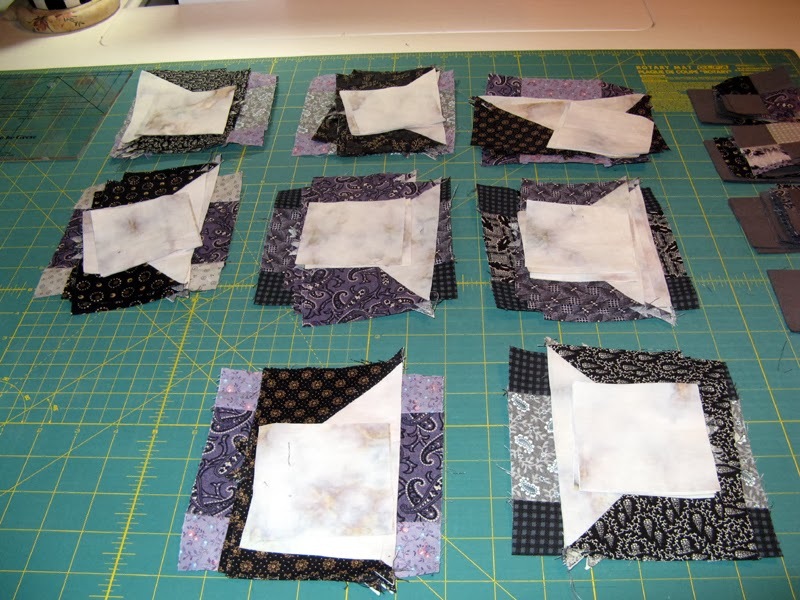 Both blocks have several pieces with the smallest pieces cut at 1 1/2" square. 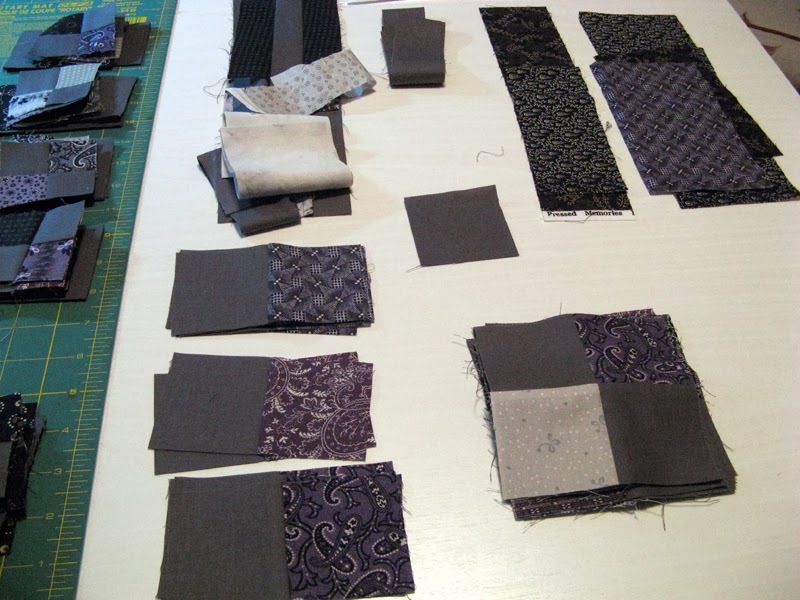 I am using grays, blacks and purples. I had hopes of finding a few more purples today at Beverly's, but no luck. 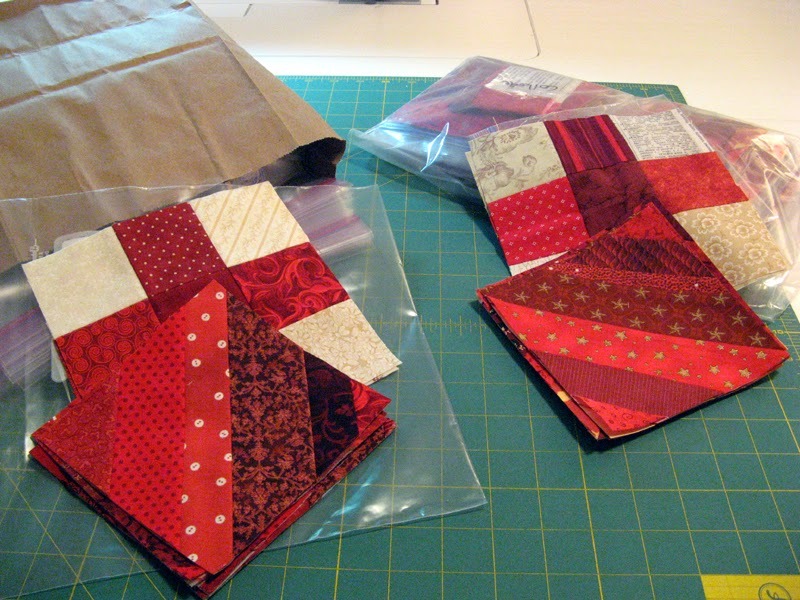 I suppose I will have enough although variety in this scrappy project is certainly desirable. I did find a sale fabric that I thought would be perfect for the back. I didn't purchase it, but I might just have to return over the weekend and get what I need. 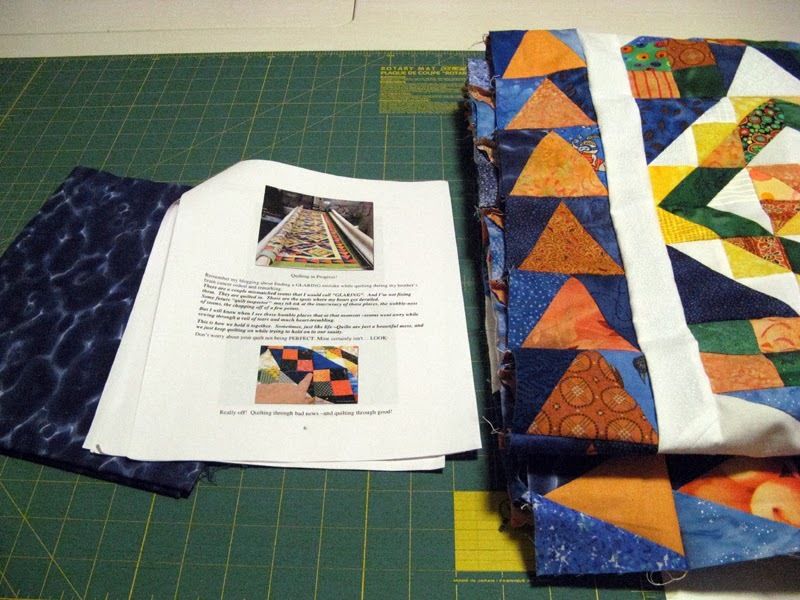 I carved out a little time to pull fabrics and sew together Margret's BOM for Sunshine Quilt Guild. 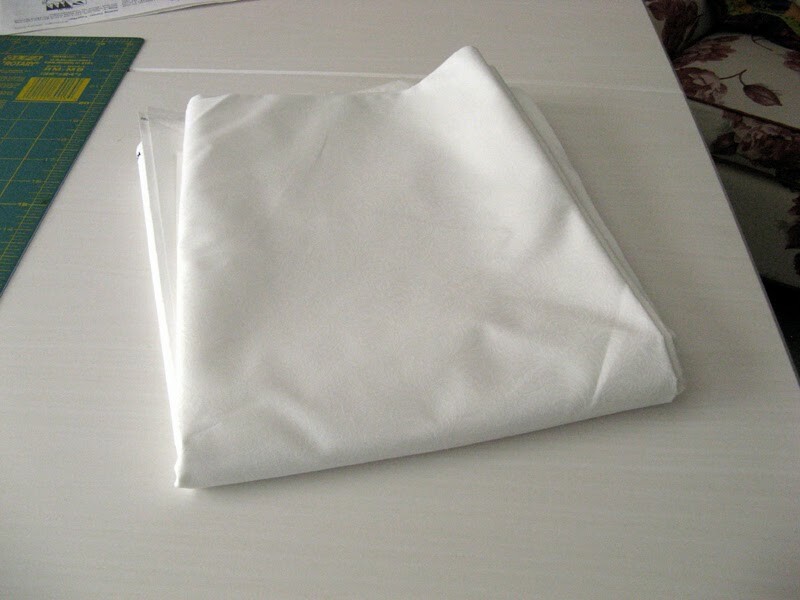 The star fabric was provided. Participants were to come up with the rest. I am thrilled to have Krossfire finished. I also finished Celtic Solstice, the Bonnie Hunter Mystery this year. I searched around a bit and finally decided on Keltic Krest for it's name. 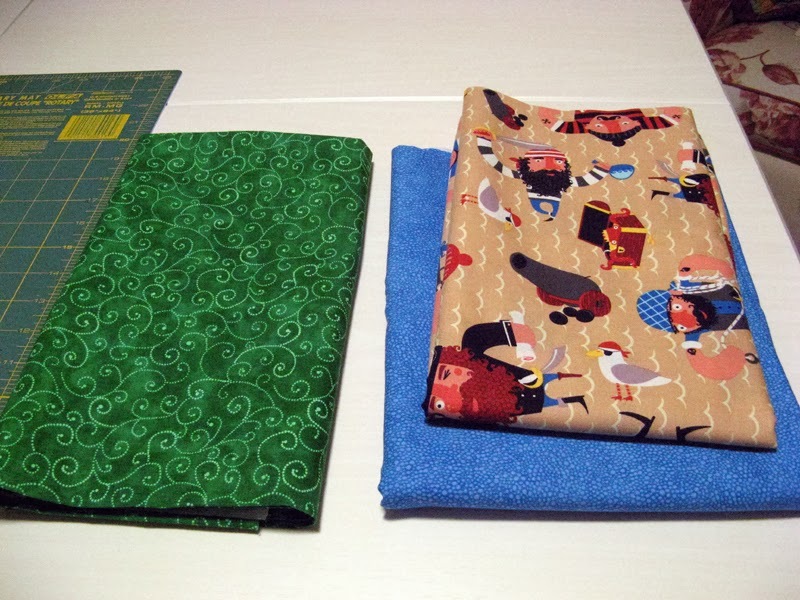 I decided on green for the 2" outer border with the blue for the binding. Beverly's had a really cute pirate print for the border I will need for my Wednesday workshop with Linda Ballard at Road to California. I purchased a coordinating blue for the complimentary fabric with shades of taupe and white for the projects center. Come back later this week for photos of Keltic Krest and the two projects that I have workshops on at Road to California on Tuesday and Wednesday. 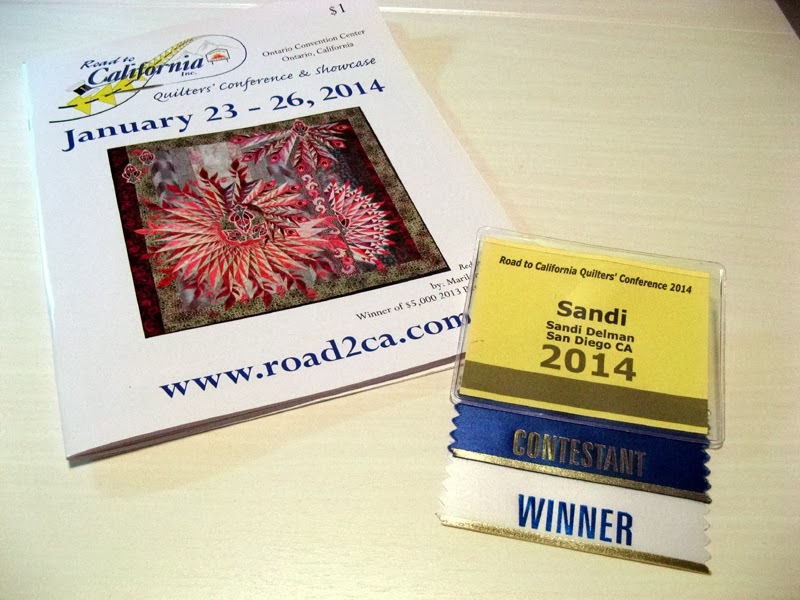 If you happen to be at Road to California this week look for my two quilts Koriander Kompass and Kartwheels! Others want to show you what they have going on with their Design Walls today. 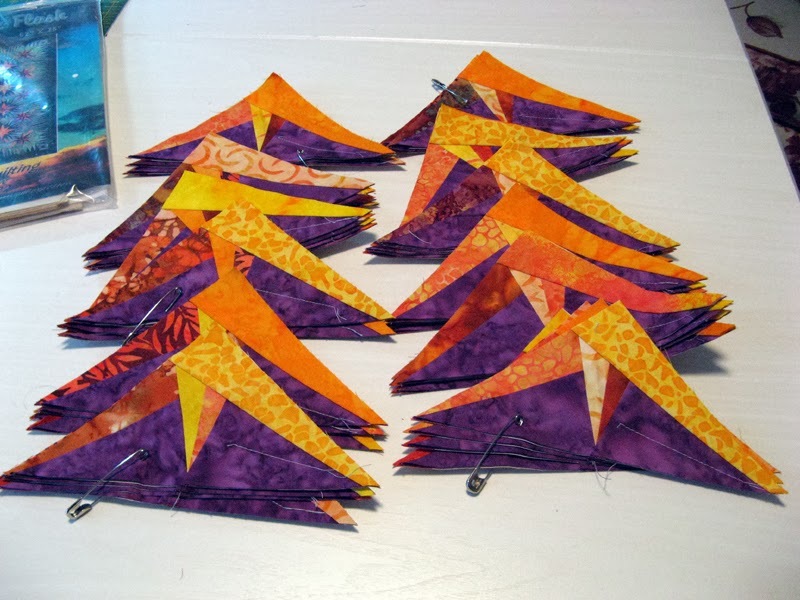 Check them out at Patchwork Times. Enjoy your week. Let me say this is a happy update... It has been a great week of finishes. 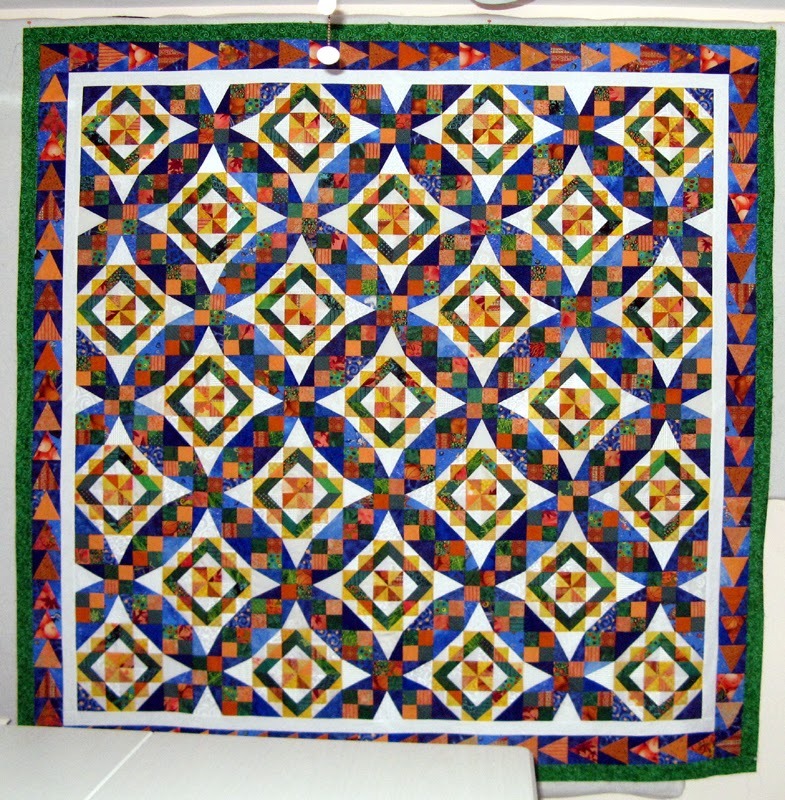 First thanks everyone who shared the oops on the Celtic Solstice pieced border unit quantities on the small size. I would have eventually figured it out, but sure was nice that the mistake was realized before I tried to figure it all out. 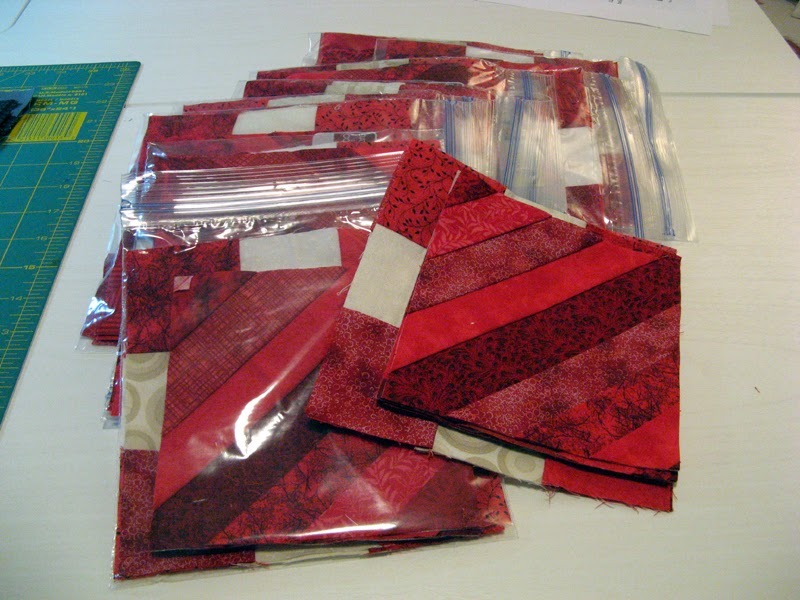 I had the four units sewn making it easy to add to my borders and reattach them. I'm going to claim the fabric from my stash even though I'm still deciding if I want the outer border to be blue or green. 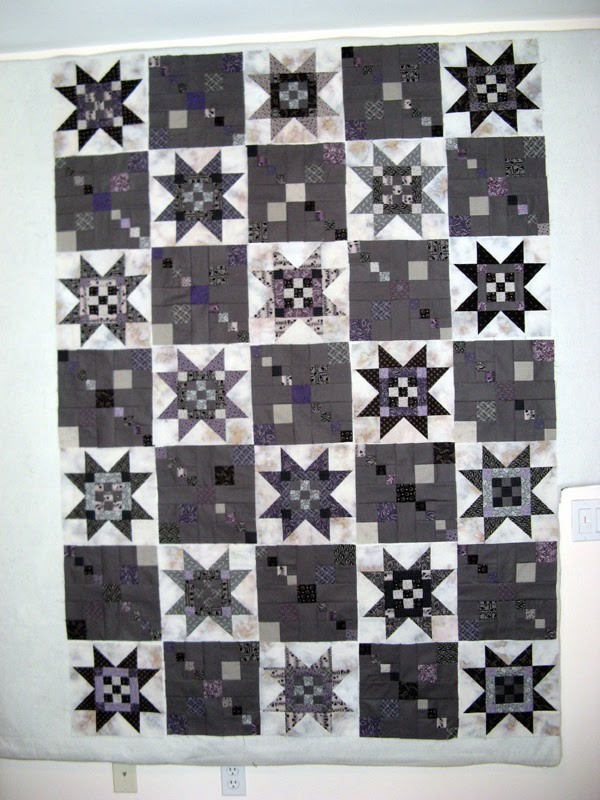 I'll have a photo of my quilt, Keltic Krest, tomorrow when the decision comes to me. Honestly I'm leaning to blue. Happy dance going on for Krossfire's completion. This one is a beauty! (Jumping Jax Flash by Judy Niemeyer.) I decided against the outer solid border. 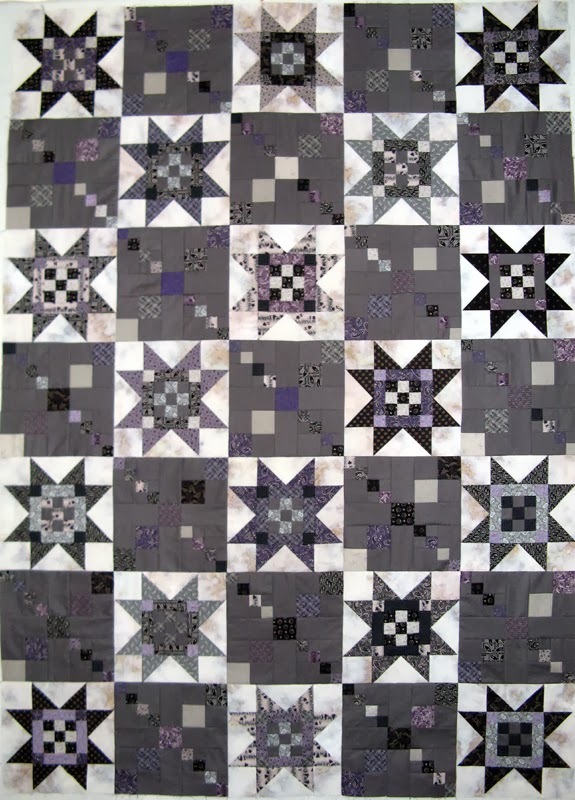 I plan for the binding to be a mixture of the dark purples that are in the spiky border. 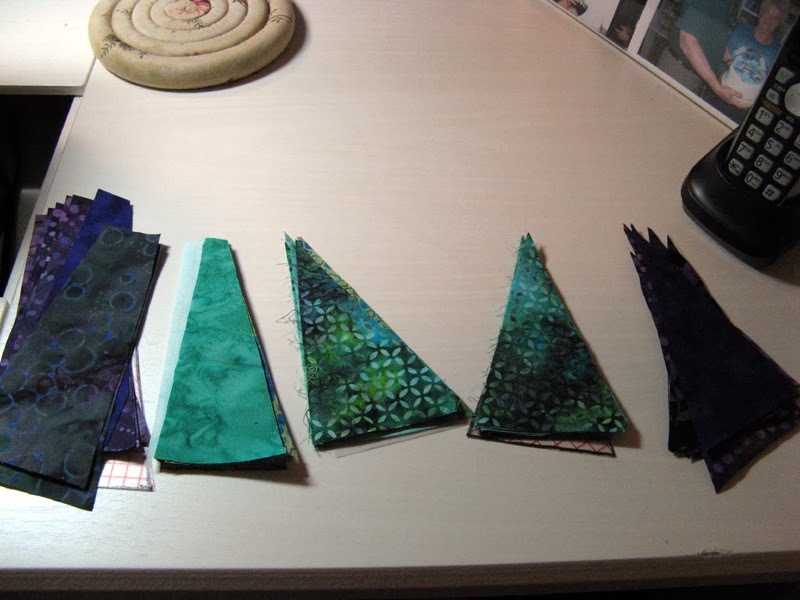 I have a few very large pieces of the teal that will be used for the back. A 2011 UFO finally finished that I started working on in July 2013. 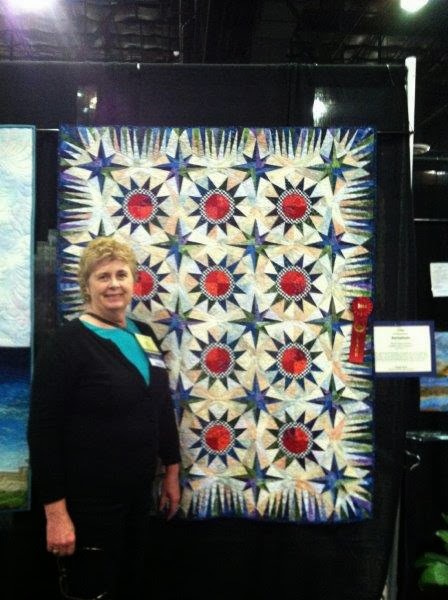 That leaves just one more Judy Niemeyer design to finish off the 2011 UFO Challenges (Briar Patch to be called Kurry). 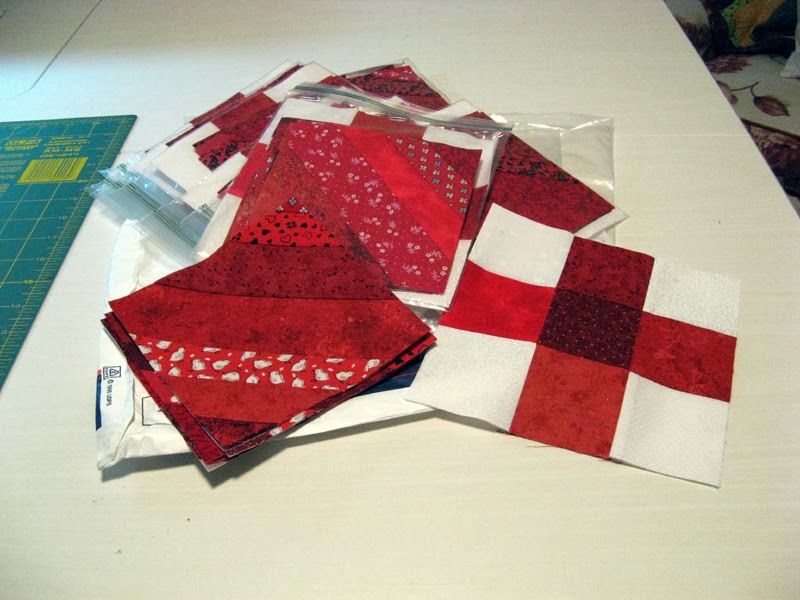 The Red Strings/Nine-Patch Swap blocks are starting to arrive... These are from Yvonne, Bonnie Sue, and Debra. They are due at the end of the month. Four have arrived so far. I wonder who will be next? Bonnie Sue, you are always so thoughtful. Browns are good!!! Thank you. On my design wall this Monday is Krossfire. I'm down to putting together the last eight pieces. YIPPEE!!! They are for the corners. A left and a right of Section JJC. This Judy Niemeyer design called Jumping Jax Flash is a UFO that I've had on my list to finish since 2011. Once all pieces are assembled next comes block assembly. I have changed just a few of the pieces so far. 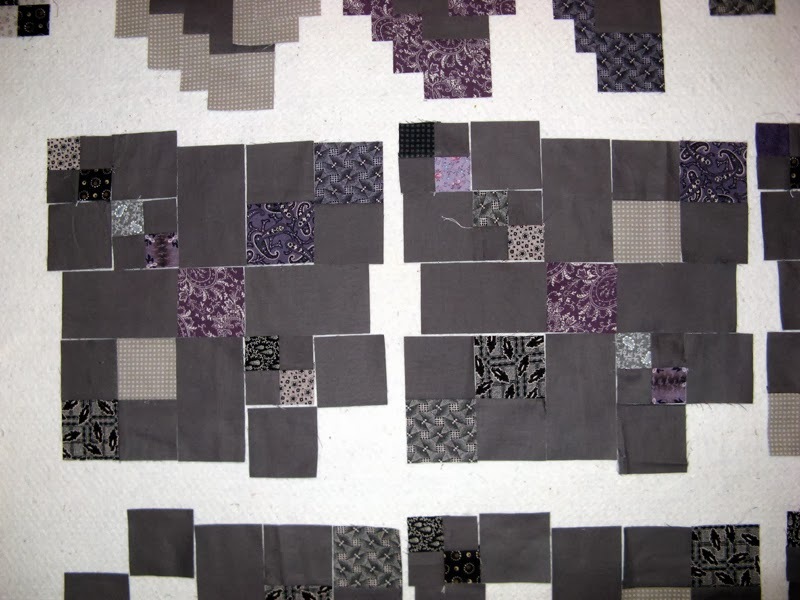 This is such a busy quilt that for the most part it doesn't seem to matter if anything matches too closely together. 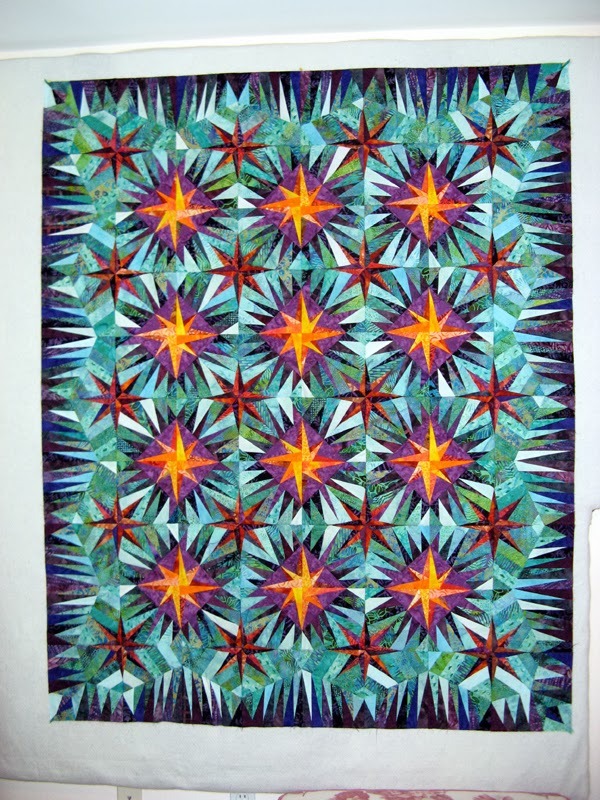 I might rearrange the yellow/light orange stars and distribute the lightest teals, but that will be about it. 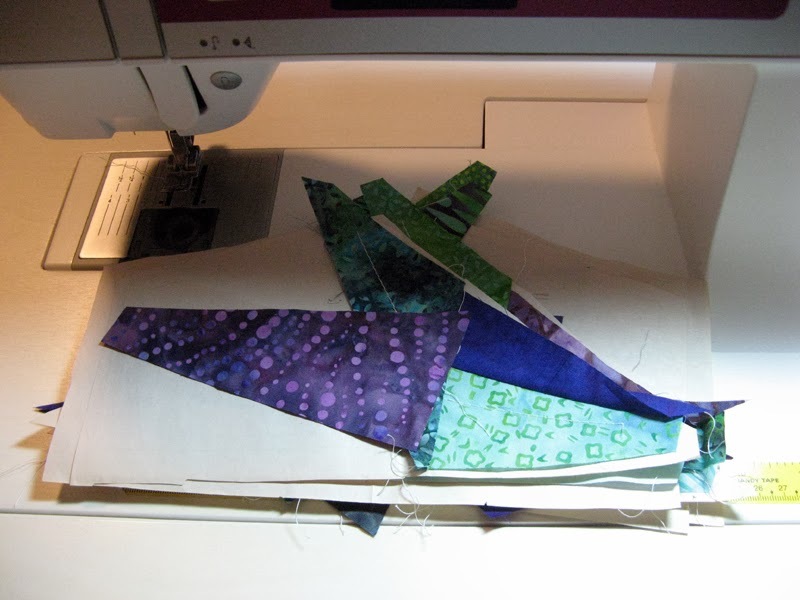 I should be working on my January UFO, but I refuse to put Krossfire down until I have all the piecing done. Hope you are working on something fun. 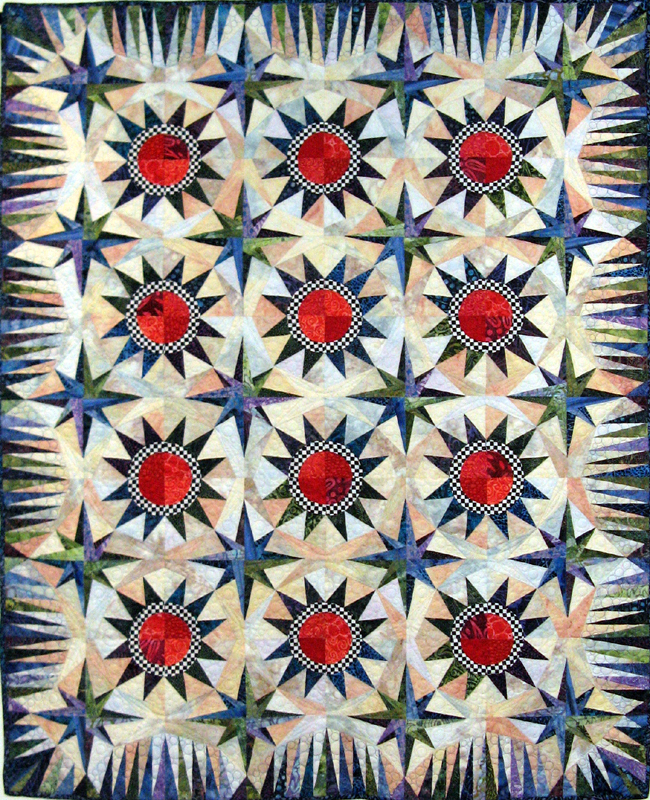 Have a great week starting off with all the lovely projects being brought to you today at Patchwork Times. Well here I go starting off my 2014 Stats with a negative... Wish I could have a completion to net the purchase out, but not quite yet. 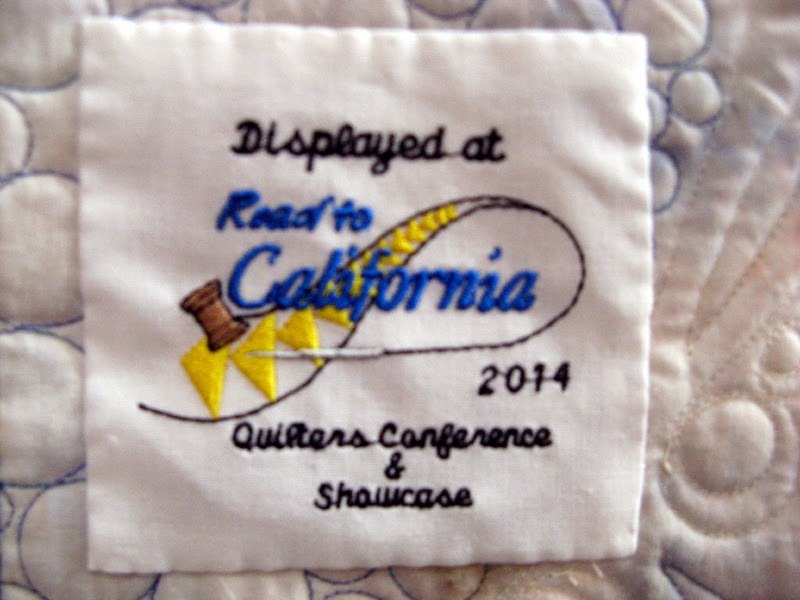 I am preparing for workshops I'll be taking at Road to California Quilt Show that takes place two weeks from now. 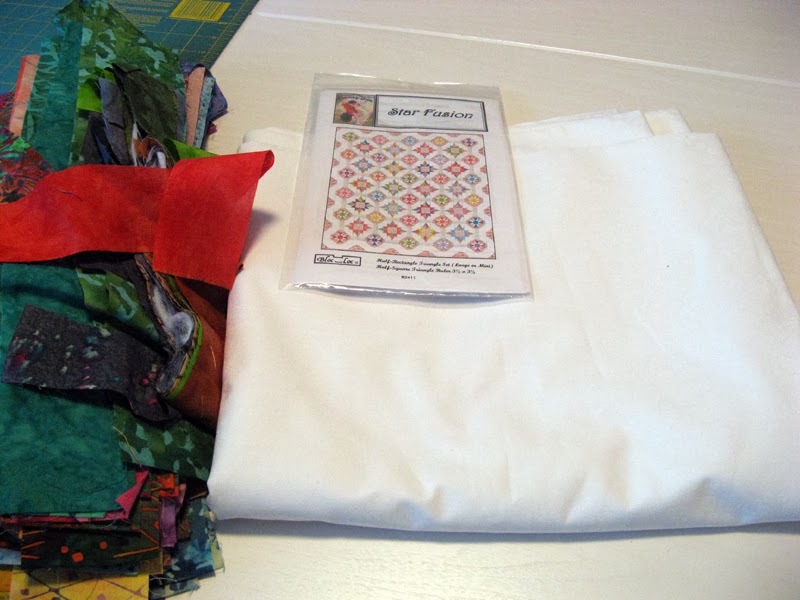 My purchase this week is the white I'll need for Star Fusion by Janna Thomas. 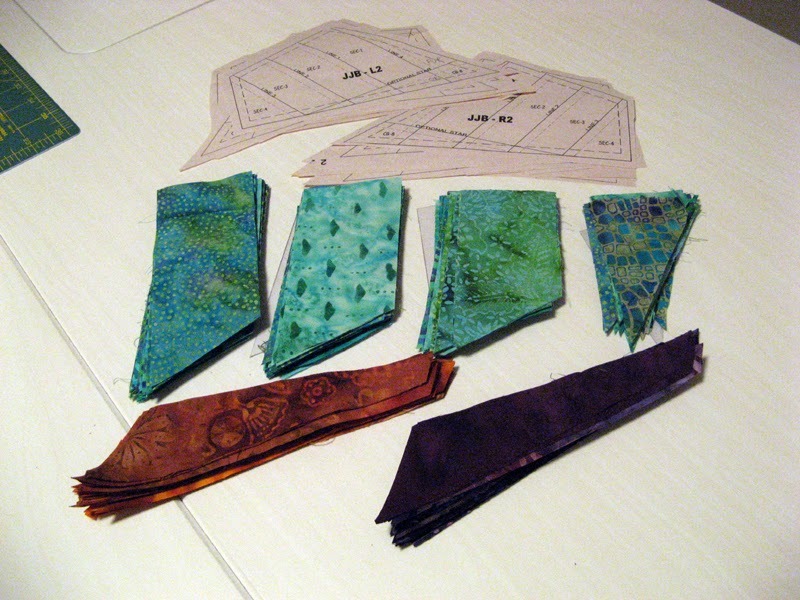 This strips are from my stash and will make up the strata for the stars. The workshop is to be led by the Bloc Loc Ruler folks. If you haven't had an opportunity to try the Bloc Loc rulers your missing out on great rulers that give perfect results. 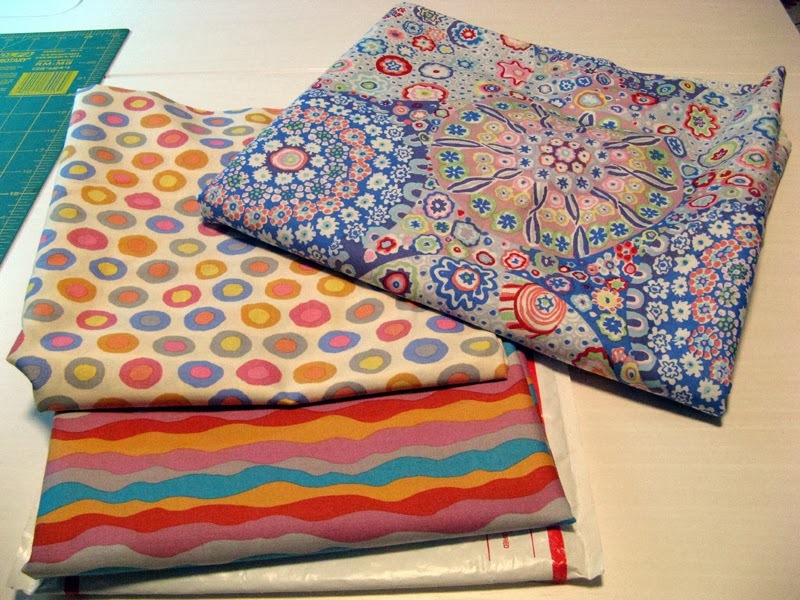 Though I don't have to count the fabric yet I have ordered these Kaffee Fassett and Brandon Mably fabrics from Glorious Color website. I had hoped to get them from Rosie's Calico Cupboard where I purchased the white, but none of them were available. 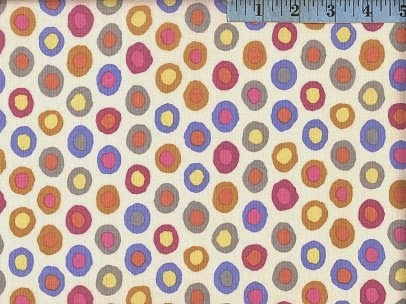 The next fabrics to get are for the workshop by Linda Ballard called Harmony Square. Besides the background I may be able to find all of the fabrics in my stash. I'm still working on Krossfire. I sure would love to have it done! I still have to get going on my January UFO... This month is moving pretty fast already. 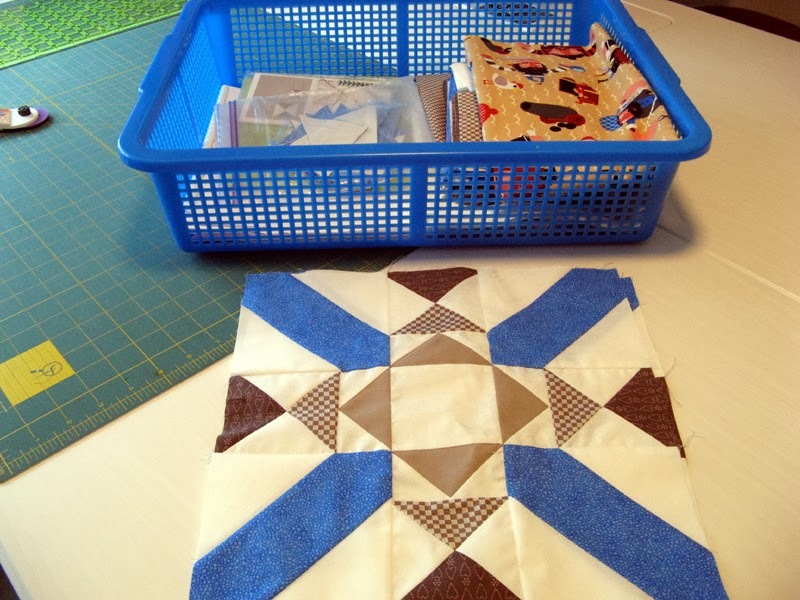 See what others are doing in their sewing rooms through the links at Patchwork Times. I had Celtic Solstice on the design wall playing around with placement of colors through Saturday. 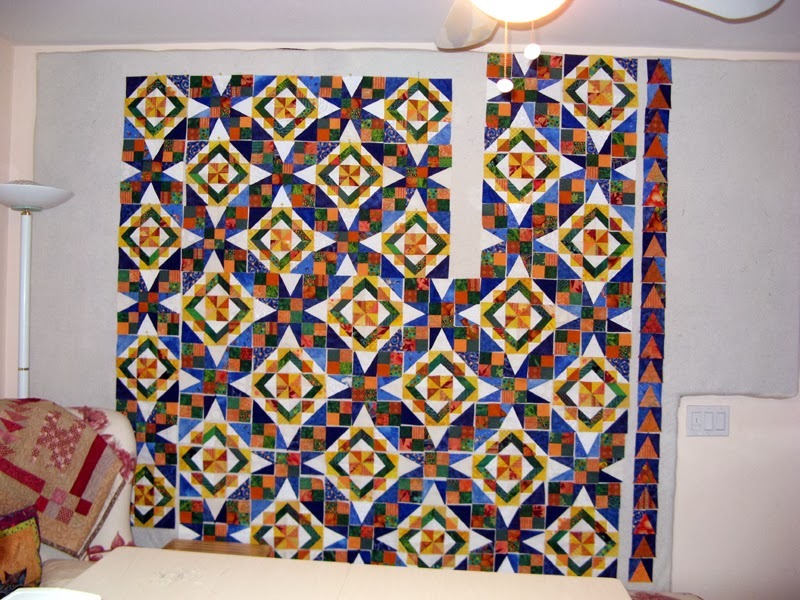 Once I was happy with it full steam ahead in putting the pieces into blocks. I have the blocks all together now and the inner white border in place. 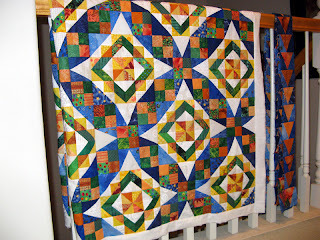 Not too happy with how the pieced border fit :(! I have seam ripper in hand! I will need to look for something appropriate for the outer border. I sure like the way this mystery turned out. It is back to work for me today after being off since Christmas Eve. Ugh! 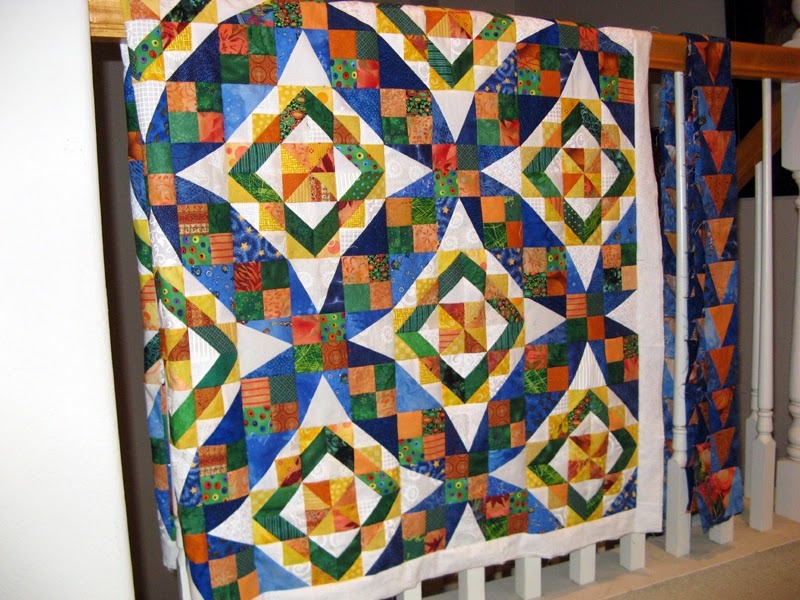 Hope you have time to look at all the wonderful projects at Quiltville and Patchwork Times. Today I've been preparing the next section of Krossfire. This is part of the border where the design connects to the stars. 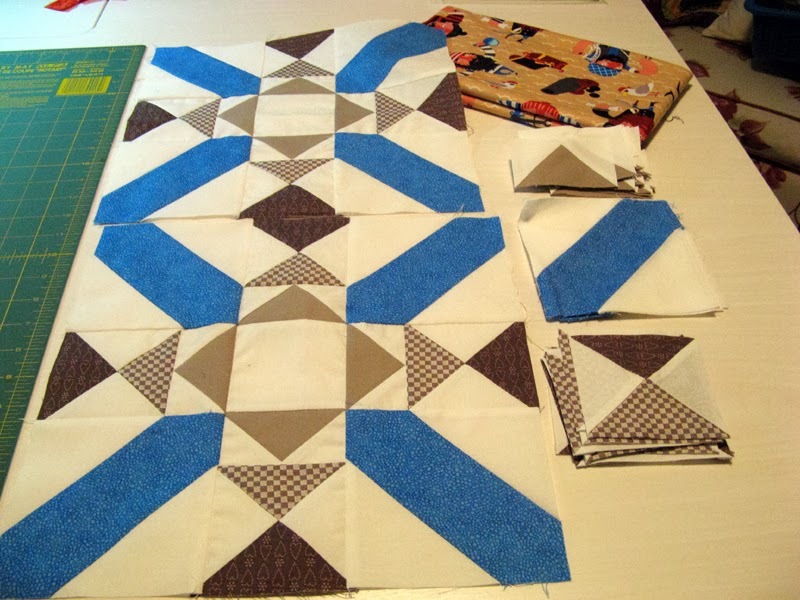 During the week I worked on finishing the outer pieces of the border. 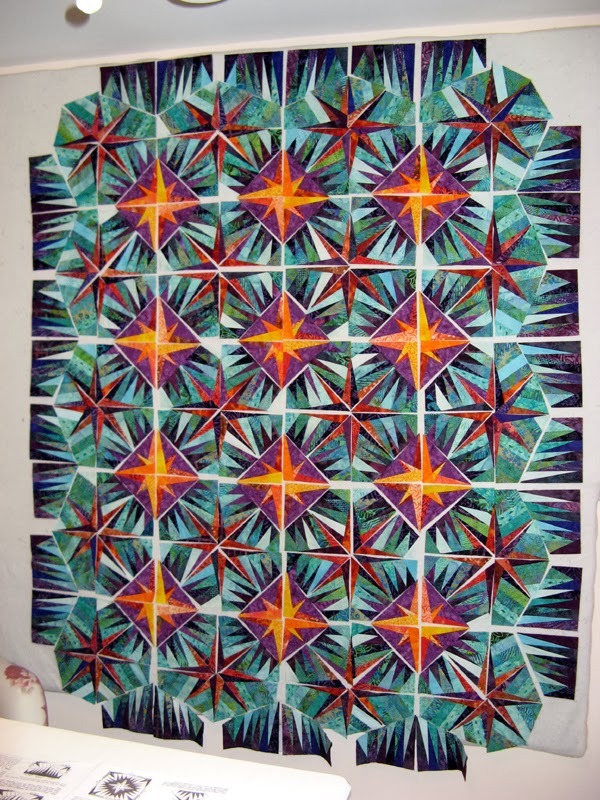 These pieces surround the center stars that are below. There is one more section yet to go...the corners. Krossfire should be done very soon now. 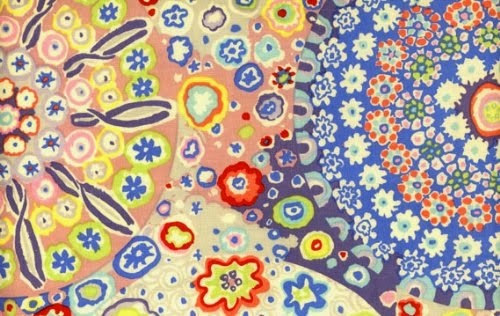 This project is one of the last two to complete of my 2011 UFOs. 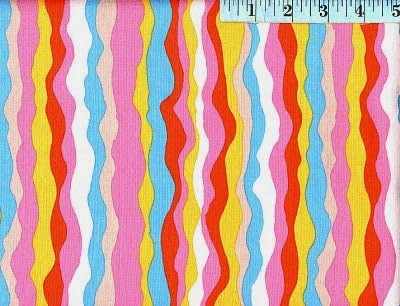 It is a Judy Niemeyer design called Jumping Jax Flash. At zeros as I begin my 2014 Stash Reports, but not for long!